Original publication date: Sunday April 13, 2003. Z machine at instant of firing (Photo by Randy Montoya) Courtesy Sandia. 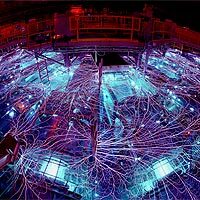 Throwing its hat into the ring of machines that offer the possibility of achieving controlled nuclear fusion, Sandia National Laboratories’ Z machine has created a hot dense plasma that produces thermonuclear neutrons, Sandia researchers announced on April 7, 2003, at a news conference at the April meeting of the American Physical Society in Philadelphia. The neutrons emanate from fusion reactions within a BB-sized deuterium capsule placed within the target of the huge machine. Compressing hot dense plasmas that produce neutrons is an important step toward realizing ignition, the level at which the fusion reaction becomes self-sustaining. The amount of energy a larger successor to Z could bring to bear offers the still-later possibility of high-yield fusion — the state in which much more energy is released than is needed to provoke the reaction initially to occur. The excess energy could be used for applications such as the generation of electricity, said Tom Mehlhorn, a project leader on the machine. Z causes reactions to occur neither by confining low density plasmas in dimensionally huge magnetic fields, as do tokomaks, nor by focusing intense laser beams on or around a target, as in laser fusion, but simply through the application of huge pulses of electricity applied with very sophisticated timing. The pulse creates an intense magnetic field that crushes tungsten wires into a foam cylinder to produce X-rays. The X-ray energy, striking the surface of the target capsule embedded in the cylinder, produces a shock wave that compresses the deuterium within the capsule, fusing enough deuterium to produce neutrons. "Pulsed power electrical systems have always been energy-rich but power-poor," said Ray Leeper, a Sandia manager. "That is, we can deliver a lot of energy, but it wasn’t clear we could concentrate it on a small enough area to create fusion. Now it seems clear we can do that." A partial confirmation of the result came about when theoretical predictions and lab outcomes were determined to be of the same order of magnitude. Predictions and measurements of the neutron yield were both of the order of 10 billion neutrons. The predicted neutron yield depends on the ion density temperature and volume. Those quantities were independently confirmed by X-ray spectroscopy measurements. Neutron pulses were observed as early as last summer but researchers were wary that the output was produced by interactions between the target and ions generated by Z’s processes, rather than within the capsule itself. Ion-generated neutrons were not the point of the experiment, since they would not scale up into a high-yield event in any later, more powerful version of Z. But a series of experiments completed in late March demonstrated that the production was within the capsule itself. To show this, researchers inserted xenon gas within the capsule. The gas prevented the capsule from getting hot during compression. Thus, the neutron yield dropped dramatically, as predicted. The action takes place within a container the size of a pencil eraser, called a hohlraum, at the center of the Z machine, itself a circular device about 120 feet in diameter. Sandia researchers Jim Bailey and Gordon Chandler led the experimental team and Steve Slutz performed theoretical calculations. Sandian Carlos Ruiz and Gary Cooper of the University of New Mexico performed the neutron measurements.